A few years ago I received a Mastercard with a CCV of 000. The CCV is the last 3 digits printed on the signature strip on the back asked for by merchants to verify you actually hold the card as those digits are not encoded on the magstrip (although as anyone who has handled the card or has hacked any of the online mechants at the time you use it also knows it). It's sometimes called CVV, CVV2, or CVC2 too. Having a CCV of 000 seems nice and easy to remember, but actually was a bit of a curse. To start with, companies would sometimes not believe that 000 is your real CCV when you tell them by phone. But usually after a few attempts you can convince them to at least try it, and then all is well. The real problems came when using the card online as several merchants refused to accept the card. Any programmer reading this will have guessed the ways this could fail already. Rather than web applications checking for a CCV of three digits, I imagine some of them stored the field as an integer and had "0" overloaded as "didn't enter a CCV". Scan Computers was the first casualty; my first order with them using the card appeared to get accepted, but then got stuck and the order stalled. That took a phone call to sort out, but at least the guy I spoke to by phone recognised and understood the problem and I only ended up getting my stuff a day late. It's worked okay with them since, I guess they fixed it. Some other merchants I've been less lucky with. Some refused to accept the CCV at the time I entered it, but at least with those you know immediately and can use a different card. Other merchants accepted the CCV at the order time but then later rejected the order usually without giving a reason; probably when they did some batch processing with the stored CCV. So you'd think there would be a lot of people with this problem: if the CCV is generated by the issuer using some hash then it ought to be 1/1000th of the card holding population. Perhaps some issuers deliberately avoid giving out a 000 security code, or perhaps I was just unlucky in my choice of merchants. The experiment has sadly come to an end now as the card expired and was been replaced by one with a different CCV. I'm hoping one day to get 999. Red Hat Enterprise Linux 5.3 was released today, around 8 months since the release of 5.2 in May 2008. So let's use this opportunity to take a quick look back over the vulnerabilities and security updates we've made in that time, specifically for Red Hat Enterprise Linux 5 Server. 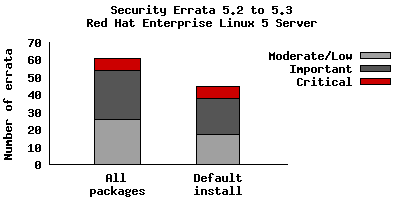 The chart below shows the total number of security updates issued for Red Hat Enterprise Linux 5 Server as if you installed 5.2, up to and including the 5.3 release, broken down by severity. I've split it into two columns, one for the packages you'd get if you did a default install, and the other if you installed every single package (which is unlikely as it would involve a bit of manual effort to select every one). So, for a given installation, the number of packages and vulnerabilities will probably be somewhere between the two. So for a default install, from release of 5.2 up to and including 5.3, we shipped 45 advisories to address 127 vulnerabilities. 7 advisories were rated critical, 21 were important, and the remaining 17 were moderate and low. For all packages, from release of 5.2 to and including 5.3, we shipped 61 advisories to address 181 vulnerabilities. 7 advisories were rated critical, 28 were important, and the remaining 26 were moderate and low. Five updates to Firefox (July, July, September, November, December) where a malicious web site could potentially run arbitrary code as the user running Firefox. Given the nature of the flaws, ExecShield protections in RHEL5 should make exploiting these memory flaws harder. An update to Samba (May), where a remote attacker who can connect and send a print request to a Samba server could cause a heap overflow. The Red Hat Security Response Team believes it would be hard to remotely exploit this issue to execute arbitrary code due to the default enabled SELinux targeted policy and the default enabled SELinux memory protection tests. We are not aware of any public exploit for this issue. An update to OpenSSH (August), provided to mitigate an intrusion into certain Red Hat computer systems. The attacker was able to sign a small number of tampered packages but they were not distributed on the Red Hat Network. We classified this update as critical to ensure any tampered packages would be replaced with official packages. Although not of critical severity, also of interest during this period were the spoofing attacks on DNS servers. We provided an update to BIND (July) adding source port randomization to help mitigate these attacks. Updates to correct all of these critical vulnerabilities (as well as migitate the BIND issue) were available via Red Hat Network either the same day, or one calendar day after the issues were public. A double-free flaw in unzip. The glibc pointer checking limited the exploitability of this issue to just a crash of unzip, a client application, which does not have security implications. No security update was needed. Two format string flaws in c++filt. The format string protection caused these issues to have no security implications. No security update was needed. Red Hat Enterprise Linux 5.2 was released last week, around 6 months since the release of 5.1 in November 2007. So let's use this opportunity to take a quick look back over the vulnerabilities and security updates we've made in that time, specifically for Red Hat Enterprise Linux 5 Server. The graph below shows the total number of security updates issued for Red Hat Enterprise Linux 5 Server starting at 5.1 up to and including the 5.2 release, broken down by severity. I've split it into two columns, one for the packages you'd get if you did a default install, and the other if you installed every single package (which is unlikely as it would involve a bit of manual effort to select every one). So, for a given installation, the number of packages and vulnerabilities will probably be somewhere between the two. So for a default install, from release of 5.1 up to and including 5.2, we shipped 46 updates to address 119 vulnerabilities. 8 advisories were rated critical, 24 were important, and the remaining 14 were moderate and low. For all packages, from release of 5.1 to and including 5.2, we shipped 62 updates to address 179 vulnerabilities. 9 advisories were rated critical, 29 were important, and the remaining 24 were moderate and low. Four updates to Firefox (November, February, March, April) where a malicious web site could potentially run arbitrary code as the user running Firefox. Given the nature of the flaws, ExecShield protections in RHEL5 should make exploiting these memory flaws harder. An update to the GnuTLS library (May), where a remote attacker who can connect to a server making use of GnuTLS could cause a buffer overflow. In Red Hat Enterprise Linux 5, the CUPS print server uses GnuTLS. An update to MIT Kerberos (March), where a remote attacker who can conect to the krb5kdc or kadmind services could cause a buffer overflow. An update to OpenPegasus (January), where a remote attacker who can connect to OpenPegasus could cause a buffer overflow. The Red Hat Security Response Team believes that it would be hard to remotely exploit this issue to execute arbitrary code, due to the default SELinux targeted policy, and the default SELinux memory protection tests. Two updates to Samba (November, December) where a remote attacker who can connect to the Samba port could cause buffer overflows. In addition to ExecShield making this harder to exploit, the impact of any sucessful exploit would be reduced as Samba is constrained by an SELinux targeted policy (enabled by default). Updates to correct all of these critical issues were available via Red Hat Network either the same day, or one calendar day after the issues were public. To get a better idea of risk we need to look not only at the vulnerabilities but also the exploits written for those vulnerabilities. A proof of concept exploit exists publicly for one of the Samba flaws, CVE-2007-6015, but we are not aware of public exploits for any other of those critical vulnerabilities. Also of high risk was an important "zero-day" exploit affecting the Linux kernel where a local unprivileged user could gain root privileges. Red Hat Enterprise Linux 5.1 was affected and a fix was available two calendar days after public disclosure. A double-free flaw in CUPS. The glibc pointer checking limited the exploitability of this issue to just a crash of CUPS and not the ability to execute arbitrary code. code execution. We still issued an update, as a remote attacker could trigger this flaw and cause CUPS to crash. An uninitialized pointer free flaw in unzip, caught by the glibc pointer checking. As exploitation of this flaw results in just a crash of a user application, no updates were needed. This data is interesting to get a feel for the risk of running Enterprise Linux 5 Server, but isn't really useful for comparisons with other versions or distributions -- for example, a default install of Red Hat Enterprise 4AS did not include Firefox. You can get the results I presented above for yourself by using our public security measurement data and tools, and run your own custom metrics for any given Red Hat product, package set, timescales, and severities. This is really a moderate severity flaw because you need a remote attacker who has the ability to start/stop/control ZoneMinder, and you really should protect your ZoneMinder installation so you don't allow arbitrary people to control your security system. (Although I think at least one distributor package of ZoneMinder doesn't protect it by default, and you can find a few unprotected ZoneMinder consoles using a web search). I discovered this because when we went on holiday early in April I forgot to turn down the heating in the house. 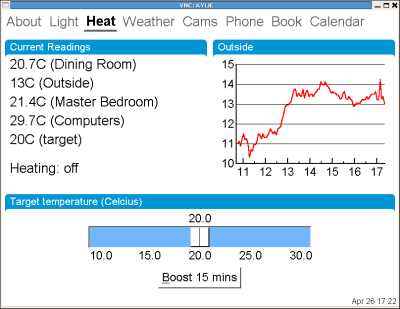 Our heating system is controlled by computer and you can change the settings locally by talking to a Jabber heating bot (Figure 1). But remotely over the internet it's pretty locked down and the only thing we can access is the installation of ZoneMinder. So without remote shell access, and with an hour to spare at Heathrow waiting for the connecting flight to Phoenix, I figured the easiest way to correct the temperature was to find a security flaw in ZoneMinder and exploit it. 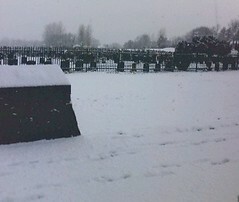 The fallback plan was to explain to our house-minder how to change it locally, but that didn't seem as much fun. So I downloaded ZoneMinder and took a look at the source. ZoneMinder is a mixture of C and PHP, and a few years ago I found a buffer overflow in one of the C CGI scripts, but as I use Red Hat Enterprise Linux exploiting any new buffer overflow with my ZoneMinder compiled as PIE definately wouldn't be feasible with just an hours work. My PHP and Apache were up to date too. So I focussed on the PHP scripts. A quick grep of the PHP scripts packaged with ZoneMinder found a few cases where the arguments passed to PHP exec() were not escaped. One of them was really straightforward to exploit, and with a carefully crafted URL (and if you have authorization to a ZoneMinder installation) you can run arbitrary shell code as the Apache httpd user. So with the help of an inserted semicolon and one reverse shell I had the ability to remotely turn down the heating, and was happy. So if you're wondering why I've not bloged in a while it's because we're just back from holiday, the first in a few years. It was pretty eventful; I got engaged to Tracy at Shoshone Point at the Grand Canyon, we saw Spamalot in Vegas, and went to see Rocco Deluca play live in LA (Tracy even managed to get a photo with her favourite actor Kiefer Sutherland who turned up to watch). I'm out on holiday soon to Arizona, so we've been looking for ways to geocode the photos we'll be taking and get a record of our route. I use a Mio A701 phone which has built-in GPS, and this time we'll be using Tom Tom in the USA rather than Mapopolis. The problem with Tom Tom Navigator is that it doesn't keep a track log, and there doesn't seem to be any plugins to allow it to do so. So here is the solution I've been experimenting with over the weekend. Make sure the GPS Intermediate Driver is enabled, on the MIO there is a built-in "GPS Settings" utility where I have it set to COM4 and "Manage GPS automatically"
Use the GPS2Blue utility. Make sure it's set to GPS on COM4, 4800 baud, with logging only of GGA/GLL/RMC/VTG NMEA, and select 'Log processed raw data...'. You don't need to enable the "2blue" bit, we're just using it to write the tracklog. Start TomTom. Make sure it's also set to COM4, 4800 baud. This will work because the GPS Intermediate Driver is opened by GPS2Blue. You can't start TomTom first, but you can exit GPS2Blue and leave TomTom running. After finishing you end up with a NMEA track log with an hour of logging taking up about 1.6Mb. Transfer it to your Fedora machine.